The Lake Oswego boys basketball team rode the roller coaster at this year's Les Schwab Invitational. The Lakers opened the tournament with a 23-point win over Southridge on Dec. 26, fell to reigning Washington big-school state champion Gonzaga on Dec. 27, came back to beat talented Central Catholic by 17 on Dec. 28, then lost a heartbreaker to Jesuit in the tournament's fifth-place game on Dec. 29. While the Lakers clearly would have liked more "ups" and fewer "downs" during their tournament, they also recognized the benefits of playing great competition. 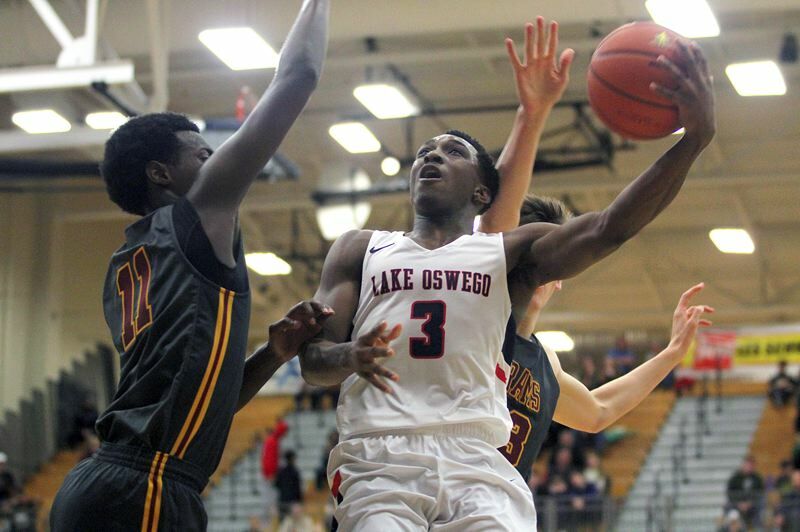 "This is a great opportunity for us to play against very strong competition and we'll take away a lot of lessons that are applicable later in the season," said Lake Oswego senior guard Josh Angle. "I think each game here is going to be a challenge with the big stage so getting to play here is exciting and I think it really helps us grow as a team," said Laker junior guard Sam Abere. The Lakers were at their best in their tournament opener against Southridge, last year's fourth-place finisher at the Class 6A state tournament. Lake Oswego — led by Angle's 19 points and seven rebounds, and Wayne McKinney's 11 points, six rebounds, six assists, two blocks and two steals — blasted out to a 17-11 lead in the first quarter, then boosted that edge to 36-17 at the half. The Skyhawks rallied in the second half and held their own in the game's final 16 minutes, but never really made any serious inroads following the Lakers' big start. In addition to Angle and McKinney's successes, Fred Harding had seven points, seven rebounds, two blocks and two steals, and Abere added eight points, three assists and two steals. For Southridge, Brock Henry scored 18 points and added nine rebounds, two assists and two steals, while no other Skyhawk player had more than six points. Facing the 18th-ranked team in the nation, Lake Oswego started fast and took a 14-9 first-quarter lead behind Angle's seven points and a defense that held Gonzaga to 3 of 13 shooting from the floor. While the Lakers' output slowed a bit in the second quarter — Angle added six more points while McKinney and Abere each added 3-pointers — they still managed to forge a 27-27 tie at the half. But Gonzaga — led by Anton Watson's 15 points, five rebounds, two assists and three blocks, and Carter Sonneborn's nine points, seven rebounds, two assists and two blocks — turned up the defense in the second half, limited the Lakers to 18 points in the final 16 minutes and pulled away to win 57-45. "We got stagnant on the offensive end," Angle admitted. "We got away from what had been working, we got a little sped up, a little rushed and it resulted in a lack of good looks in the second half." Still, there were some highlights, including Harding's work against the 6-foot-8 Watson, a national top 100 player. "It was a good challenge to see how much I could handle," Harding said. "Honestly, I wasn't too worried about it. As long as you go out there and compete, I knew I could at least hang with him." Angle finished with 21 points and nine rebounds, Abere added eight points, four rebounds, three assists and two steals, and senior Brandon Roberts added seven rebounds. The Laker defense was at its best in the win over Central Catholic, holding the Rams to just 31 percent shooting from the field (including a 2 of 16 day from 3-point range) and just 18 points in the second half. The win also reversed a 60-55 Rams' win over the Lakers two weeks earlier. "It's definitely good because we bounced back from a loss and I think that … this is really going to push us forward, especially getting one back after they took one at our house," Abere said. For McKinney — who led the Lakers with 20 points after a tough shooting night against Gonzaga — the win was just another marker in the team's progression. "We are still getting stuff together — we're getting together — becoming a great team, (but) I feel like we still have a ways to go to become a championship team," he said. The Lakers and Rams were almost dead-even in the first half, tied 8-8 after the first quarter and Central Catholic leading 22-21 at the half. But Lake Oswego took over in the second half, with McKinney scoring 12 points in the first 3:33 of the half to give his team a 36-24 lead. Then, after the Rams edged back within 40-33 at the start of the fourth quarter, the Lakers closed out their win with a 16-5 run highlighted by two 3-pointers by junior Casey Graver, a Harding dunk on the fast break and an Angle "3" that pushed the lead to 56-38. "That's something we preach every day at practice — just be ready when your opportunity comes and Casey and Sam and all of our teammates embody that," Angle said. The Lakers couldn't get over the top against Jesuit in their finale, however, with the Crusaders piecing together a 32-22 first-half lead and holding off a Laker challenge in the second half. Jesuit's Justin Bieker was the biggest thorn in the Lakers' side, racking up 28 points, eight rebounds and six steals, while teammate Aiden Williams added 14 points, five rebounds and two assists in the victory. The Crusaders led by seven points after the first quarter, 10 at the half, and were still up 45-35 going into the final period. The Lakers — getting 14 points from McKinney and 12 each by Angle and Graver — eventually outscored Jesuit 22-18 in the final quarter, but couldn't come all the way back.